May 4, 5, 6, Robert Zimmermann Sensei leads a seminar at Aikido of Dallas. I’m sure AOD will post times and price information soon. 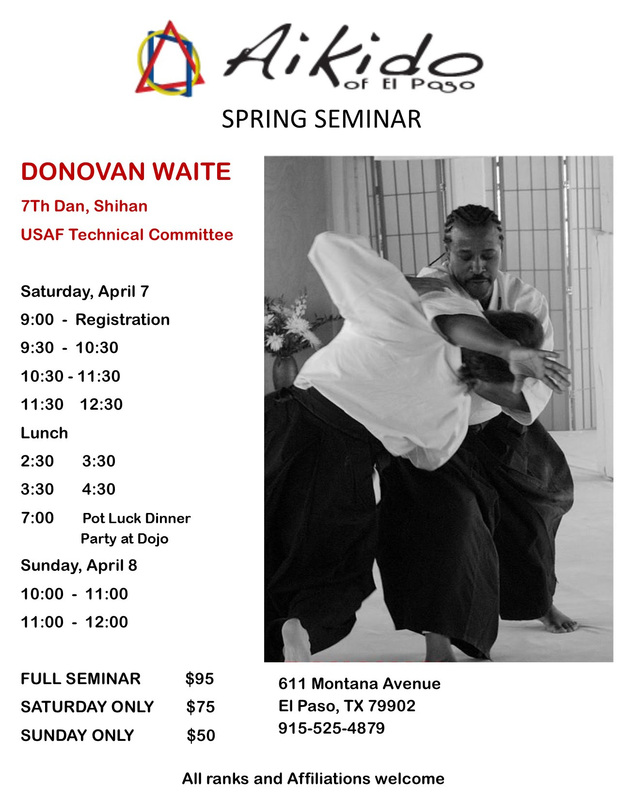 Would be a good thing to go if you can – show solidarity of USAF dojos in the area, as well as appreciation for Mason Sensei hosting these events. Spring Seminar Saturday, April 7th & 8th 2018.
from Sunday, July 29th to Saturday, August 4th. We will be returning to the Stockton Seaview Hotel and Golf Club, located at 401 South New York Road, Galloway, New Jersey. To accommodate Aikido camp participants, their family and friends, the hotel has blocked off a number of rooms at a discounted rate, including a very limited number of rooms for arrival prior to camp on Saturday, July 28th. at the time of registration, you will not incur charges for your hotel reservation until your actual stay. The DEADLINE for registration is Friday, June 22nd but the blocked off USAF discounted hotel rooms may be fully occupied prior to the deadline. Information about purchasing day fees can be found through the registration link below. Our new on-line site has simplified the registration process, and allows you to register more than one person at a time and complete your payment without leaving the site. Peter Bernath shihan, and Penny Strake Bernath shihan lead a seminar at Austin Aikikai. O-Sensei Memorial seminar at Aikido of Austin with David Halprin sihan, Barbra Britton shihan, and Josef Birsdong shihan. USAF O-Sensei Memorial seminar at Midwest Aikido Seminar in Chicago with Yamada Sensei. Robert Zimmermann leads a seminar at Aikido of Dallas. Skip Chapman (usually) leads a seminar at Aikido of Denton. 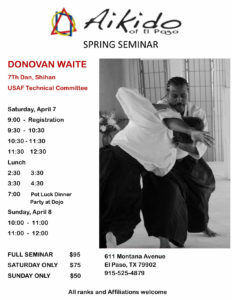 Donovan Waite shihan leads a seminar at Aikido of Austin. Peter Bernath shihan leads a seminar at Aikido of San Antonio. Harvey Konigsberg shihan and John C. shidoin (often) lead a seminar at Austin Aikika. We will also be giving a break and our last class of the year will be on Saturday December 22nd where Maryellen sensei will be teaching adult class and Bob sensei will be teaching the kids class. First class of 2013 will be on Wednesday January 2nd where you can start strong full of resolutions, Aikido being one of them, of course. We will be doing a demonstration at LER Schimelpfenig Library, in Plano, on Friday, October 19. The demonstration will be part of a youth program about Manga (Japanese comics). We should start about 3pm, so please be at the library and ready to demo by 2:45. We will have mats provided by Plano Parks and Rec. Here is the library information. The next adult and kids Kyu test will be on Saturday Feb 25. For those that are planning to test, it gives you almost two months to prepare for it. Check to see if you have the practice hours needed for testing, and if you have questions please consult Shiba Sensei. In order to test, you need to get a brown belt or black belt to sponsor you and help you review. You can ask Sensei or any senior Aikidoist to help you in reviewing the techniques required for your level, but you need to do it well before testing time. On Saturday, Dec. 10, we will be having a Holiday Season Party/Potluck lunch. We’ll have the facility to ourselves that day. Please bring your spouses, families, significant others, etc. We’ll have adult practice as usual that day. Between adult and kids practice we will take group photos of the entire dojo. So parents – please get you kids to class early that day. After photos, the adults will then have plenty of time to clean up, change clothes, and prepare food in the party room at the dojo. Here is a link to a spreadsheet on which to record what you are bringing to the party. More information in the next week.